Friday August 2 1907 I dressed chickens and fried doughnuts, got dinner. We went in afternoon to see The Juggler. The folks were all there. Louisa went in town got home at 5.20. I came the car before and we went back together in evening were with the folks and had a good time, cooler tonight Saturday August 3 1907 I friend my chicken, prepared other things and took our dinner to the grounds at 11.37. Left good dinner for the boys. We had a fine time with the folks. W.J. Bryan spoke this afternoon. I came home for supper. Lorna stayed I went back in the evening. There was a concert by [illegible] singers. 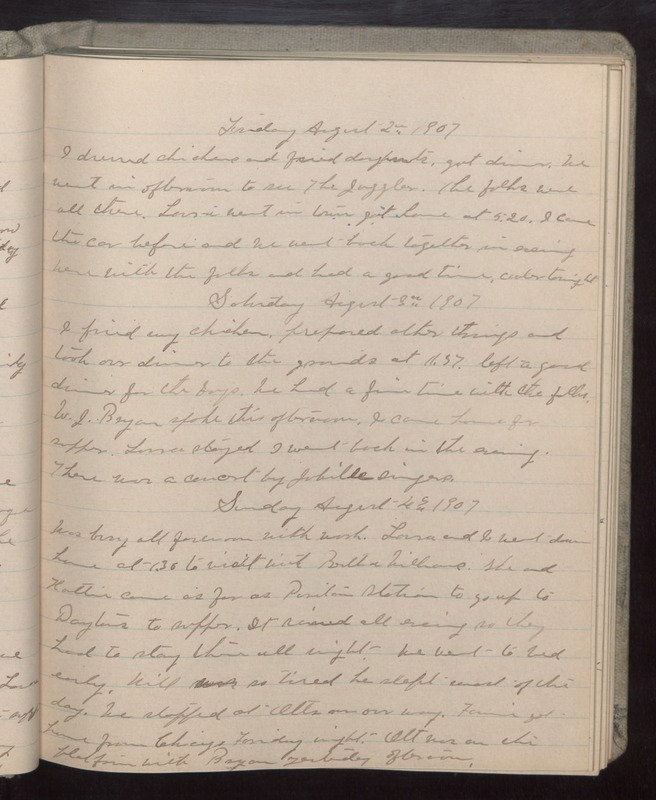 Sunday August 4 1907 Was busy all forenoon with work. Lorna and I went down home at 1.30 to visit with Brother [Williams?]. She and Hattie came as for as [illegible] station to go up to Dayters? to supper. It rained all evening so they had to stay there all night. We went to bed early. Will so tired he slept most of the day. We stopped at Otts on our way. Fannie got home from Chicago Friday night. Ott was on the platform with Bryan yesterday afternoon.